The rent at 110 Horatio Street Apartments ranges from $3,595 for a studio to a $6,025 one bedroom. Apartments in this building are about 53% more expensive than the West Village average. 110 Horatio Street Apartments is a nine minute walk from the L 14 St-Canarsie Local at the 8 Av stop. This apartment is in the West Village neighborhood in New York. Nearby parks include Abingdon Square, Playground and Seravalli Playground. 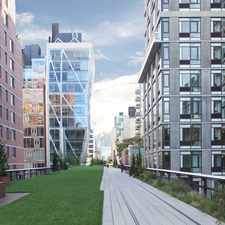 110 Horatio Street Apartments has a Walk Score of 95 out of 100. This location is a Walker’s Paradise so daily errands do not require a car. - Conveniently located near the M11, M12,M14A bus lines and a short walk to A,C,E subway lines. Explore how far you can travel by car, bus, bike and foot from 110 Horatio Street Apartments. 110 Horatio Street Apartments is a Rider’s Paradise which means world-class public transportation. Car sharing is available from Zipcar, Hertz On Demand, RelayRides and Enterprise CarShare. View all West Village apartments on a map. 110 Horatio Street Apartments is in the West Village neighborhood. West Village is the 13th most walkable neighborhood in New York with a neighborhood Walk Score of 100.